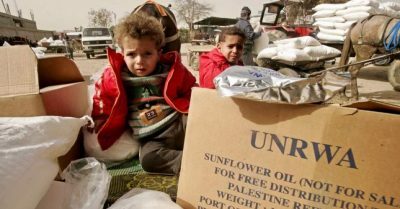 Earlier this year, the Trump regime cut over $300 million in UN Relief and Works Agency (UNRWA) aid, providing vital services for millions of Palestinian refugees. On August 29, remaining US funding for UNWRA was halted entirely, the Trump regime in cahoots with Israeli harshness on defenseless Palestinians, pressuring, bullying and intimidating PA leadership to bow to their will. They want Palestinians to accept a no-peace/peace plan, abandoning fundamental rights dear to everyone everywhere, including self-determination, the right of return, and freedom from illegal occupation harshness. A Trump regime official said a statement on halting all US UNWRA funding will be announced in the coming weeks. On August 24, Trump regime hardliners cut another $200 million in humanitarian aid to Palestinians – funds to be used for so-called “high priority projects elsewhere,” according to the State Department. The Trump and Netanyahu regimes are suffocating millions of Palestinians, holding them hostage to their demands. Depriving millions of “hungry, angry, under-educated” Palestinians of essential humanitarian aid, fuels conflict instead of ending it. “In just seven months, we have raised 238 million dollars – $50 million from Saudi Arabia, $50 million from the UAE,” along with generous Russian and Turkish contributions. (W)e still have a deficit for this year of $217 million” along with considerable funding needed for next year. An appeal to Arab League countries was made to fund what the Trump regime halted. Last year, Washington supplied $365 million to UNWRA, about one-third of its $1.2 billion budget, a significant shortfall to make up with all US funding to the agency halted. Part of Trump regime policy is getting denying diaspora Palestinians their legitimate right of return to their homeland – what no government can legally deny them. On Wednesday, Ziofascist US UN envoy Nikki Haley said the Trump regime took the Palestinians’ right of return “off the table” in future peace talks – largely by pretending only around half a million Palestinian refugees exist, not five million, including their descendants, the legitimate number. Trump and Netanyahu want UNWRA abolished, its humanitarian aid to millions of Palestinian refugees ended. They want fundamental Palestinian rights denied – the notion of Palestine as their legitimate homeland abandoned. It’s part of longstanding US/Israeli collective punishment on Palestinians, an unaccountable high crime against humanity, toughened since Trump took office.